Some photo’s of our pageant, it was an amazing success and we got huge support from the enormous crowds that lined the streets and cheered. We chanted who loves their bike and the response ‘we do, we love our bikes’ We gave out almost ten thousand treasured Love Your Bike poetry winning poems, especially printed on lovely memento postcards. Watch this space we are hoping to publish the twelve short listed poems in a Artist illustrated publication in time for Dublin Velo City. 10.50 am Photo opportunity with participants and artists in their St. Patrick’s Day parade attire with props, including Joanna Donnelly, meteorologist and author of The Great Irish Weather Book, illustrator Fushcia McAree, and actor and poet PJ Brady who will perform a short piece on Patrick Kavanagh and the bicycle at the launch. The joint first winners in the adult category are poets Catherine Ann Cullen for ‘Memory of My Rothar’ and Iggy McGovern for ‘A Cyclist’s Prayer’. The Judges were Maureen Kennelly Director of Poetry Ireland, Sinead Connolly, Dublin City Council Arts Officer and Donna Cooney, Artistic Director of Joyce-Cycle for Dublin Cycling Campaign. There were seventy entries in the Joyce-Cycle Poetry Competition, which was launched on Valentine’s Day. Poets were encouraged to submit poems on the theme of ‘Love your Bike’. The winning poems will be published online and printed on postcards and book marks, which will be given out to public viewers during the St. Patrick’s Day Parade 2019. The title of the Dublin Cycling Campaign’s pageant in the St. Patrick’s Day Parade 2019 is Joyce-Cycle. It will include over one hundred participants of all ages, from babies to those in their late 80’s. The theme will bring to life the wonderful writings of some of our best-loved Irish writers with connections to the bicycle, including James Joyce, Flann O’Brien, Jonathan Swift, Oscar Wilde, Samuel Beckett and Dervla Murphy. Participants have taken part in workshops to create wearable books, incorporating original book covers for their favourite books. Some well-known Irish writers and personalities will also join in, astride and merged with their beloved bicycles!. Participants have taken part in workshops to create wearable books, incorporating original book covers for their favourite books. Some well-known Irish writers and personalities will also join in, astride and merged with their beloved bicycles! Saturday 2nd March Next pageant making workshop is in Tailors Hall starting at 11 am. Thursday 7th March Press launch by invitation announcement of winners of poetry competition 11 am Venue Poetry Ireland. Saturday 9th March Dress rehearsals book in for one hour slots from 11 am venue Tailors Hall, logistics and wristbands distributed to participants. The Title of the Dublin Cycle Campaign in the St. Patrick’s Day Parade 2019 is Joyce-Cycle..
On Valentine’s Day, when you might be penning a love poem to your nearest and dearest, Dublin Cycling Campaign is launching a poetry competition on the theme of the beloved bicycle. As many cyclists already know, you can become very attached to your bicycle. Expressed in the words of Flann O’Brien, in ‘The Third Policeman’, written at the end of the 1930s but published only posthumously, he outlined his “Atomic Theory” of cycling: spend too long on a bike, O’Brien argued, and you’ll begin to exchange atoms with your machine! As we joyfully celebrate the many Irish writers who incorporated the bicycle in their literature, Dublin Cycling Campaign is today launching a poetry competition in collaboration with Poetry Ireland on the theme of bicycles. There will be a junior under 16 and senior category, with cash prizes ranging between €200 and €500. Winning poems will be published online and printed, with the poet retaining copyright for any further publications. There will be three judges, one from the Dublin Cycling Campaign, one from Poetry Ireland and one from the sponsors. It would be preferable if poems were no more than 40 lines, but can be as few lines as you wish. They must be original and previously unpublished. There is no entry fee and you may submit multiple poems. There will be a further press launch on the 7th March when the winners of the Poetry Competition will be invited to read their poems. Dublin Cycling Campaign will be in the main body of the parade, following on from the success of its highly-regarded pageant Freedom Machine last year. The Campaign will be ahead of a marching band and guaranteed RTE live coverage, and will also be included in the Irish Times Festival Guide and the main St. Patrick’s Festival Guide. Printed versions of the winning poems on cards and bookmarks will be given out to the watching public on St. Patrick’s Day, to encourage interaction and promote the winning poets. We celebrate Irish Writers and the connection with the bicycle. 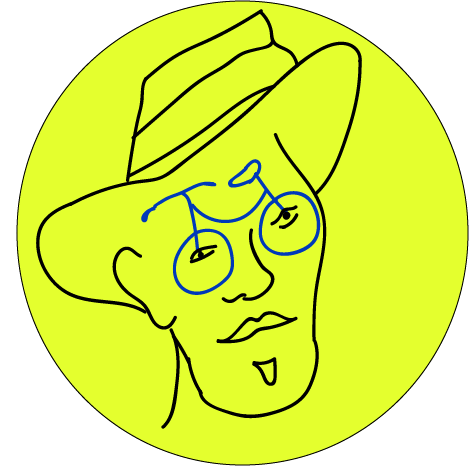 From James Joyce, Jonathan Swift, Sterne, Oscar Wilde, Samuel Beckett, Flann O’Brien and many others that have found inspiration from the bicycle. The concept is by Artist Donna Cooney who developed the highly regarded Freedom Machine in the 2018 Parade. Ms. Cooney will co-ordinate Joyce-Cycle in this year’s parade. The parade creative team will be assisted by Artist’s Laragh Pittman and Gary Brady who also worked on the Freedom Machine pageant. In the circular hell described in the book, keen cyclists end their lives sleeping standing in hallways with their elbows propped up against walls. Bicycles take on humanity, and begin creeping around at night and stealing from pantries. It’s all gloriously weird. O’Brien’s fellow Irishman Beckett was a huge cycling fan. The literary critic Hugh Kenner argued that his most famous (and most famously absent) creation, Godot, was himself based on a Monsieur Godeau, a French national champion racer. The spirit of cycling suffuses Beckett’s novel Molloy. You can hear the pedal strokes in the staccato rhythms of his sentences. Molloy himself is so dependent on his bicycle that when he is separated from it he can barely move, and is forced to ratchet himself along the road on his crutches. For Beckett, bikes were more than mere vehicles: they were prostheses. There will be over one hundred participants of all ages from babies to those nearing their 90’s. This creative Joyce-Cycle pageant will bring to life the wonderful writings of some of our best loved Irish writers. Participants will take part in workshops in Tailors hall to create the pageant. We will also be joined by contemporary Irish writers and well known faces astride and merged with their beloved bicycles. There will also be a poetry competition on the theme of bicycles in collaboration with Poetry Ireland https://www.poetryireland.ie/ with winners in the under and over 16 categories. The writers will win a cash prize. Winning Poems will be published online and printed. Printed poems on cards and book markers will be given out to the public viewers on the day to encourage interaction. This is the first year that the Dublin Cycling Campaign will be in the main body of the parade this is due to the success of our pageant last year. We will be ahead of a marching band and guaranteed RTE live coverage, we will also be included in the Irish Times festival Guide and the main St. Patrick’s Day festival guide. We will also celebrate the amazing writings of Dervla Murphy is best known for her 1965 book Full Tilt: Ireland to India With a Bicycle, about an overland cycling trip through Europe, Iran, Afghanistan, Pakistan and India. She followed this with volunteer work helping Tibetan refugees in India and Nepal and trekking with a mule through Ethiopia. Murphy took a break from travel writing following the birth of her daughter, and then wrote about her travels with Rachel in India, Pakistan, South America, Madagascar and Cameroon. She later wrote about her solo trips through Romania, Africa, Lagos, the states of the former Yugoslavia and Siberia. In 2005, she visited Cuba with her daughter and three granddaughters. ‘Stewart Parker’s play Spokesong, which was the hit of the 1975 Dublin Theatre festival and was done in London, New York and all over the world. It is all about the bicycle, set in an old bike shop in Belfast that’s being threatened with demolition by the city council in favour of a road-widening scheme. It’s a celebration of the history of the bike as a democratic force (including the emancipation of women – one of the characters is a Suffragette.). Imagine the city as a giant body… That’s what it really is. Diagnosis not good. Circulation sluggish. Lungs, badly congested. Severe constipation. So what does this plan propose as a cure? Great Scott – a heart transplant! Two words, that’s all. It’s brutal. It’s demented. Ripping out the houses and shops and people – whole communities – so that you can truss up the city centre with enormous roads, coiling thirty feet up in the air, ramming themselves across the river and through parks and into every resident’s nervous condition. Sit back and think about it – just for a minute. You can look out from my shop straight up a hill that’s a main route into the city centre. Every morning, down they come, roaring and tumbling headlong – the commuters – the gabardine swine. They get to the intersection at the bottom – and immediately turn into a snarling, writhing, raveled-up knot of ulcerous vindictiveness. We shouldn’t be promoting that. We ought to be outlawing it. The time has come to rediscover the faithful bicycle. What it all comes down to – is personal mobility in an area of maybe five square miles. At the moment there’s just five square miles of anger and internal combustion. But supposing all the cars could be banished…What would be left. Buses. Taxis. Feet. Buses travel on fixed routes at fixed intervals. Taxis are expensive, wasteful and luxurious. Feet take too long and get too tired. Something more is needed…Imagine a fleet of civic bikes…gleaming with the city’s coat of arms…stacked on covered racks on the corner of every street…which anyone can ride anywhere, free of charge, inside the city centre. The air clean. The people healthy. The time saved. The energy conserved. Earth would not have anything to show more fair.